Include as much information as possible, tell us what your most important files/ folders are so that we can most effectively help you. Tell us about any recovery steps taken, symptoms or error messages. Once you have completed this form, print the result and include it in your box. For your convenience, a shipping label is provided at the bottom of this form. All fields identified by an asterisk (*) are required. By submitting this form, you are agreeing to pay an evaluation fee. The evaluation fee will be applied to the total cost of your recovery service when you accept the quote that will be sent to you after evaluation. If you answered NO, this selection may delay the evaluation and place a hold on your recovery project until we can contact you to discuss your specific requirements. Breaking the seal may void your warranty! Drives that are received with previously broken seals are subject to additional recovery charges. Please call us at 1-866-401-5860 to discuss. Please provide more details regarding the circumstances of the failure or inaccessibility. If this is an emergency, check the box below to have a recovery agent contact you immediately. This is an emergency. Please have your recovery agent give me a call. To ensure a safe delivery of your media, make sure that all media you ship is wrapped in protective packaging to avoid any additional damage in transit. 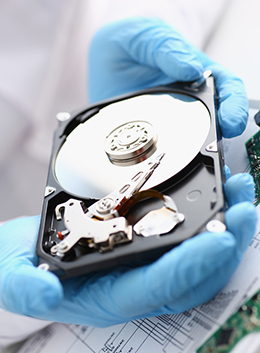 This will help further ensure the recovery of your data when it arrives at Kenedacom's Montreal Data Recovery lab. We recommend shipping your drives via certified mail or with a carrier that provides a tracking number. For your convenience, here is a Shipping Label that you can print and attach to your package. If you are within driving distance of Kenedacom, you're always welcome to drop off your media for evaluation or we can provide a pick up service. We are open 9:00 AM to 5:00 PM from Monday to Friday. By checking "I Agree", you acknowledge that you have read, understand, and agree to all of our Data Recovery Terms and Conditions, especially the disclaimers, the limitations of liability, and the waiver of jury trial. We can retrieve data not only from damaged hardware but also when files are erased or overwritten.